having really only just starting this blogging lark, I’m having a little break! (what a slacker!!). I had a nice surprise in my garden yesterday! Here my photo!! okay. I’ll stop cheating! I cropped it to share…. 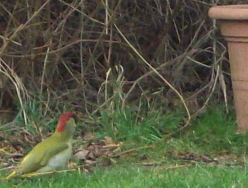 having the Green Woodpecker in the garden was lovely – she stayed for ages! she must have liked something in the grass as she was quite busy! playing with the photos made me think about how much i can miss when i only see from a distance – for me, it made me think about taking the trouble to look, expecting to ‘see’ beauty and good in the world, and also about to think that sometimes all I can do is trust there’s something there when i can’t see it for myself… I’ll stop thinking now!! a new take on an old message?!! so I phoned the 2pm commitment, and we changed it to 11am… so I could leave at 12.30, chase back here in time for the 2pm nativity. Marvellous. Afterwards (it was lovely, by the way! aah!! ), a lad I know started chatting to me, kept me a few minutes more than I’d planned to stay… hmm…running late to get errands done…never mind…haven’t seen him for a while, lovely lad, give him some time and attention. As I left, I just so happened to be exactly at the right place on the path to see a ‘mum’ I haven’t seen for ages and have been concerned about. Perfect timing, and I was able to spend some time having a chat with her, which we both valued. a perfect Advent message from Andy Warhol’s art works? I think it’s true… I’m actually more excited about the presents I was given yesterday and will have to wait a couple of weeks to unwrap (yes, I’m squishing them to guess what they are! ), than I will be when I get to open things immediately. They’ll be nice too, but the anticipation is part of the fun of it all. I saw a film the other day, ‘The Imam and The Pastor’ (more details on the page, ‘a peace initiative on film’). It’s only 40 minutes long, but it really struck at the heart of some of my cynicism. This film reminded me in a profound way that peace starts where I am, where we are, and that that witness can be powerful and can make a difference. These guys were literally killing each other’s families, yet found a call from each their own faiths to find a way to forgive. It’s very challenging stuff. 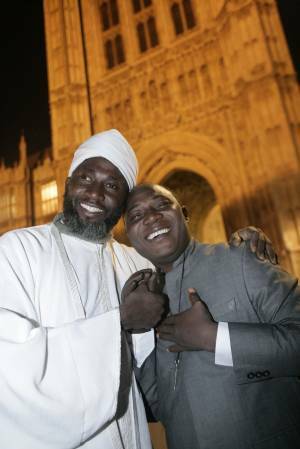 photo of ‘The Imam and The Pastor’ visiting London for the London Premier of the documentary film about them and their peace initiatives. I’ve been thinking more about the ‘lively leap’ of our spirits as we recognise God (see yesterdays post). there is so much that speaks of God and calls us to life, ‘lively leaping’ life of joy, and I wonder if we get distracted and ‘tune out’, or, if we’ve not yet recognised God, are so generally distracted that we miss out altogether. do we end up in drudge? ‘I came that you might have life, life in all abundance…’ (Jesus, in John 10 verse 10, Bible)…with spirits that have a lively leap…! Thomas Merton, looking at Advent sermons by Guerric of Igny, talks about the ‘quickening’ of foetus John-the-Baptist in Elizabeths womb when she met with Mary (herself pregnant with Jesus). What d’ya reckon then? ready to have your spirit ‘leap up with lively joy’?! I love this idea, the quickening of the spirit, internal recognition that is beyond the intellect and is about ‘knowing’ on a different sphere. I’ve been blessed enough to meet people with whom I’ve had that ‘click’ and sense of my spirit ‘leaping up with lively joy’, and it’s amazing. I’m guessing you know what I mean! I guess those things are like a ‘pre-cursor’ of what we can experience if we’re open to God. Here’s to some lively leaping of spirits! I’ve been thinking this Advent how bad we are (I am!) at enjoying where we’re at – Advent is something in itself – not just ‘how many days is it til’ Christmas now?’. I think perhaps we miss out when we view one stage as only a necessary ‘hoop to jump through’ to get to the next stage. I’ve been wondering how I can be more in the Advent spirit – to live in the sense of anticipation, enjoy the deliciousness of feeling hope, enjoy the ‘now’ intrinsically. …it’s good to move on when the time comes and embrace the new stage of life, age, challenge, but all we actually have is now – yes, a time of waiting, preparation, and also, if we allow it to be, and are able to be truly in it, ‘the time of now’.